Chrissy is a student at Mars University. 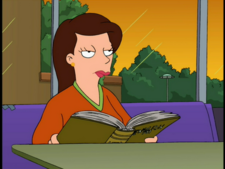 She rejects Fry's attempt to pick her up, but eagerly gives Guenter her phone number, much to the chagrin of Fry. 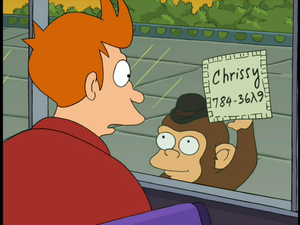 Chrissy's phone number (784-36λ9) contains the Greek letter lambda (λ). The scene where Guenter shows off her number to Fry is a reference to a scene in Good Will Hunting, where the titular Will Hunting shows off a girl's number in a similar fashion to an arrogant jerk who struck out on the same girl. This page was last edited on 11 April 2013, at 19:15.